The Harbinger is a well rounded battlecruiser; it doesn't have the legendary tank of the Drake or the firepower of the Hurricane, but can be depended on to perform well in any role. This battlecruiser is a shield tanked cruiser's nightmare, with the ability to wield six heavy pulse lasers and still have the CPU and powergrid left over to fit a respectable tank allowing it to wreak havoc on the battlefield. The Harbinger, even with a large tank, ironically has the ability to be rather agile within engagements. Its large CPU and Powergrid gives it the ability to fit a 50MN Microwarpdrive and burn towards many targets that are out of range, while the 75 m3 drone bay and bandwidth allows the Harbinger to field either a full flight of medium drones or a full flight of light drones, depending on circumstances. Like many Amarr ships the Harbinger is not the easiest ship to fit, and much will be gained by training fitting skills to at least IV, and V is recommended. This particular battlecruiser is a great incentive to train the Amarr Battlecruiser skill to at least IV. Lastly, the Harbinger has the ability to be fit either a full armor or shield tank. 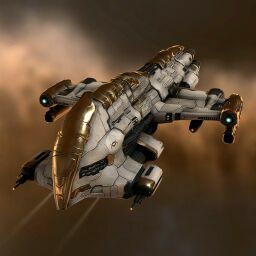 Amarr Battlecruiser to at least IV to get more DPS out of the Harbinger's lasers and keep it cap stable. Gunnery V, Medium Energy Turret V and Medium Pulse Laser Specialization trained to at least I to fit T2 guns, which do more damage and are substantially cheaper than the meta 4 variants, and give the pilot the ability to use Scorch ammo. While Medium Beam Laser Specialization is not as common, there are a number of circumstances where the range of the Beam lasers is appreciated. As for the Pulse, the cost of the Tech II Beam Lasers is much lower than the Tech I meta 4. Controlled Bursts IV, Capacitor Management IV and Capacitor Systems Operation IV are all important for cap management. Rapid Firing IV, Surgical Strike IV are skills which increase DPS and are thus vital to all turret-based damage dealing ships. Along with the obvious Power Grid management V and CPU management V fitting skills required for fitting most ships, Weapon Upgrades V should be trained to help with fitting. Advanced Weapon Upgrades is also an important skill for pilots wishing to armor tank. Sharpshooter IV increases the already impressive optimal range associated with lasers and should be trained as such. Drones V, Light Drone Operation IV, Drone Interfacing IV and Gallente Drone Operation II/Minmatar Drone Operation II are all are important for getting as much DPS out of the 75 m3 dronebay as possible. The appropriate skills required for fitting a T2 Armour or Shield Tank. This page was last modified on 17 April 2019, at 16:42. This page has been accessed 236,180 times.